This dish was a big hit in our house. Flavorful fork-tender, juicy chicken thighs resting in a tangy Mexican green sauce. A delicious and easy one-pot chicken dinner. 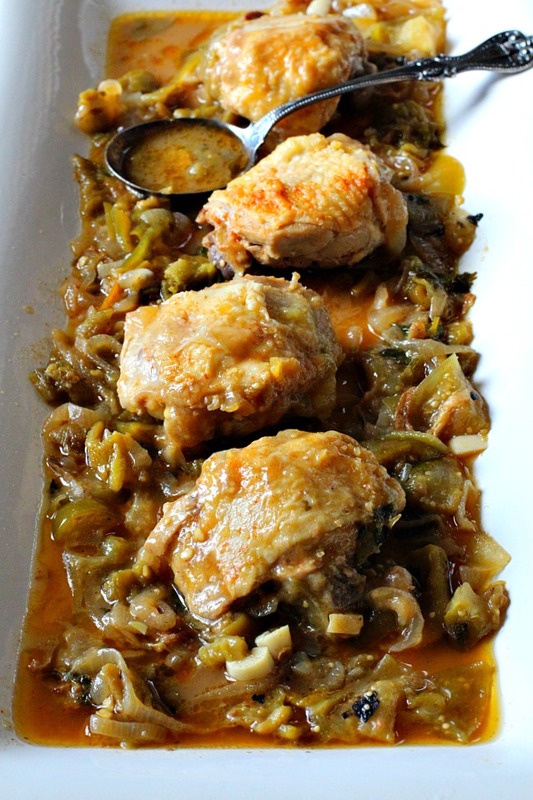 Frying chicken thighs nice and crispy and then braising them in a Mexican style gravy makes these Chicken Thighs in Tomatillo Wine Sauce a divine treat. It’s a meal that will remind you of one from your favorite Mexican restaurants. In my humble opinion, chicken thighs are the best part of the chicken. So much flavor and when cooked correctly a tender and tasty treat. And for our preference, cooking “correctly” simply means a quick fry to brown the skin all over and then braising in a sauce of your choice. This time the sauce is a green sauce made smoky due to the roasted Hatch Chile and tart and savory with tomatillos, chicken stock and white wine. Tomatillos are an easy fruit to use in your meal plans. Small, round and green, tomatillos look like unripe tomatoes and are known as tomates verdes in Mexico. Tomatillos have a tart herbal taste and can be used in salsa verde, soups and stews. To remove the husks, hold the fruit under warm running water, strip off the husks and rinse off the sticky residue from the skins. Means, everything in it’s place. This one pan dinner comes together easily if you practice due diligence in chopping and dicing before beginning. The french term Mice en Place was pounded into our heads daily when I attended Culinary School. And it’s a habit that’s well worth the time to master. This recipe calls for roasted Hatch chile. I have a stash of roasted chiles in my freezer, so this is an easy task for me. Roasting chiles are easy if you have a gas range. No Hatch available? Just place fresh Anaheim, poblanos or Hatch directly over the flame of your gas stove, resting them on your stovetop grates. Turn them frequently until they’re blackened on all sides. When done, place the chile in a plastic zip lock bag and let them steam for about ten minutes. Then the skins will slide off easily. No need to remove each and every inch of the blackened skin, leaving a trace here and there will increase the smoky flavor. Never run the peppers under water to remove skins. You’re washing away valuable flavor. Chop the onion and tomatillo and mince that garlic. Chop the cilantro and measure the cumin. Gather your bottle of white wine and your carton of chicken stock. You’re ready to get to work. Which White Wine Should I Use for Cooking? And speaking of cooking with wine. Always cook with a wine that you’d drink. I like inexpensive chardonnay or more frequently I buy Catalunya White Wine (Spain). Rene Barbier Mediterranean White. It’s under $10 and is crisp, fresh and floral with a hint of citrus it seems to be perfect for the kitchen. And it’s what we used daily at Cooking School. Please don’t use cooking wine from the grocery store. Don’t want to use white wine? Just omit and increase the chicken stock to two cups. Not a thigh person? Of course you can use bone-in, skin-on chicken breasts. Boneless skinless will work also, but will be a bit drier. Also, boneless skinless thighs can be substituted in this recipe. Instead of serving the chicken whole, shred the meat and gently mix into the sauce. Eating a chicken thigh that’s been slathered in sauce can be a bit messy. So if you’d like an easier dining experience. Shred the meat. Before serving the sauce, use an immersion blender for a smoother texture and appearance. Want to go vegetarian? Omit chicken and add some potatoes for a stew-type experience. Really want to kick up the flavor? Use roasted jalapenos. Your choice to remove seeds and veins. If you leave them you’ll get more heat from the pepper. Serve this over rice or even mashed potatoes. If you’re shredding the meat you can serve with a warm tortilla. 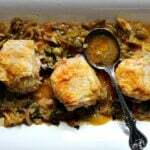 This recipe was inspired and adapted from the cookbook One Pot Of The Day. I’ve included an affiliate link for your convenience. I am a participant in the Amazon Services LLC Associates Program, an affiliate advertising program designed to provide a means for us to earn fees by linking to Amazon.com and affiliated sites, at no additional charge to you. Heat the oil in a large sauté pan over medium-high heat. Salt and pepper the chicken thighs on all sides. Working in batches, sear the chicken until browned on all sides, about 8 minutes. Transfer the chicken to a plate. Reduce the heat to medium, add the onion to the pan, and cook until softened, 3 to 5 minutes. Add the wine to deglaze, stirring to scrape up any browned bits from the bottom of the pan. The add the chicken stock. Add the roasted chiles, garlic, tomatillos, chopped cilantro, and cumin. Bring to a boil, then reduce the heat to low. Return the chicken and any juices that’ve collected on the plate to the pan, cover, and simmer, turning once, until the chicken is opaque throughout, 20 to 30 minutes. Transfer the chicken to a platter and tent with foil to keep warm. Add the lime juice to the sauce remaining in the pan and simmer over medium-high heat until slightly reduced and thickened, 10 to 20 minutes. Season with salt and pepper. If a smoother sauce is desired, pulse all or half the sauce in a food processor or blender until the desired consistency is reached. Pour the sauce onto a serving platter and using tongs place chicken pieces on the sauce. If you'd like spoon a little of the sauce over the chicken. over the chicken Garnish with the whole cilantro leaves. Serve with rice or tortillas on the side. If you don't have a stash of frozen roasted Hatch Chile peppers, you can substitute a small can of chopped Hatch chile. Or roast Anaheims or Poblanos for a substitute. My does that sauce sound heavenly!!! I am always in a dinner rut and this is a good way to emerge from that!!! Thanks Liz. Let me know if you make it and what you think. 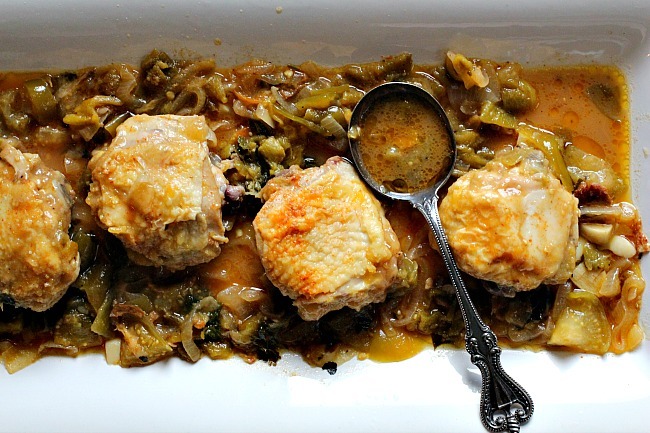 Great dish — super way to cook chicken. And a fun way to use a tomatillo sauce (love those little things!). Great Notes, too. Thanks! Totally agree about the thighs being the best part of the chicken. 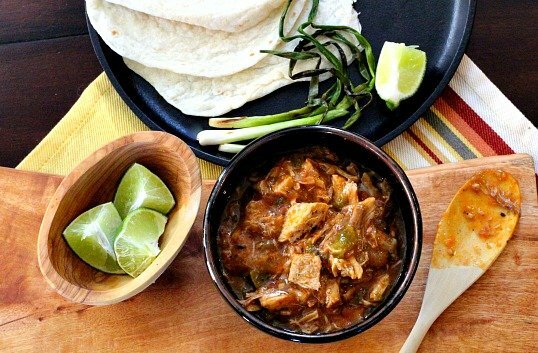 Of course chicken with chile and tomatillo is a fantastic combination of flavors! What a great dish and it looks like you managed to get your chicken skins nice and crispy. That’s something that I haven’t been able to accomplish so I just remove the skin, thus losing the flavors that skin can add to the dish. Well, since I have lots of chile in the freezer, I need to try your recipe. You know we’d love it im this house. I didn’t used to be so good at those crispy thighs. Culinary school taught me not to be afraid of high heat. Thanks so much MJ for stopping in and the comment. Great flavor combo. I’ve never really used tomatillos except with pork. 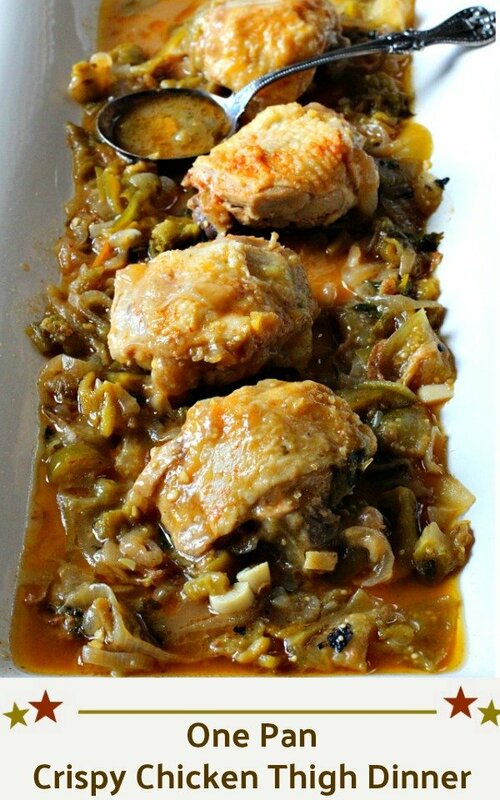 Chicken thighs are my favorite and I have some in the refrigerator right now! Let me know if you make it, I’d love your opinion. 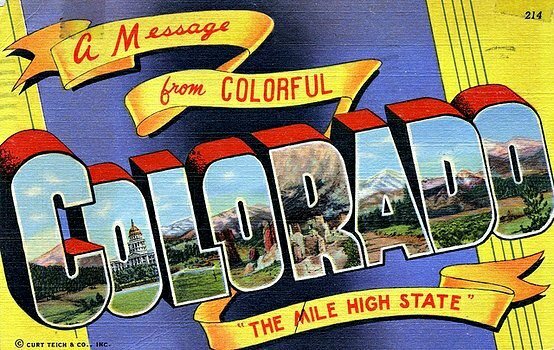 We sure like it around here. Great recipe! Made half a recipe for us and it was so tender and flavorful;. Served with a queasadilla. Thank you so much for letting know. So glad you enjoyed it.